And yet, some truly tiny numbers are also associated with the tiny, sometimes frustrating puzzle cube. For instance, 6. The top speed cubers — people who compete in speed cubing competitions, complete with special techniques, lubricating oils for their cubes, and cubes designed especially for speed solving — have solved a Rubik’s Cube in under 6 seconds! It’s become a universal part of the pop culture lexicon. (I’ve featured Rubik’s Cube Halloween costumes here in the past.) There is even Rubik’s Cube art. 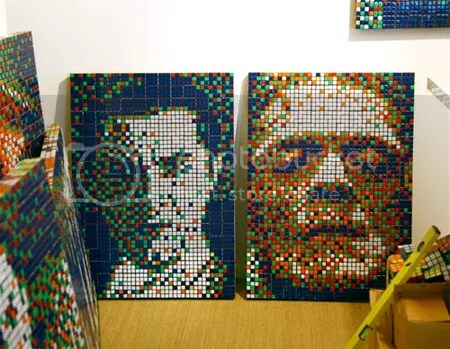 Images made from patterns formed with numerous Rubik’s Cubes. 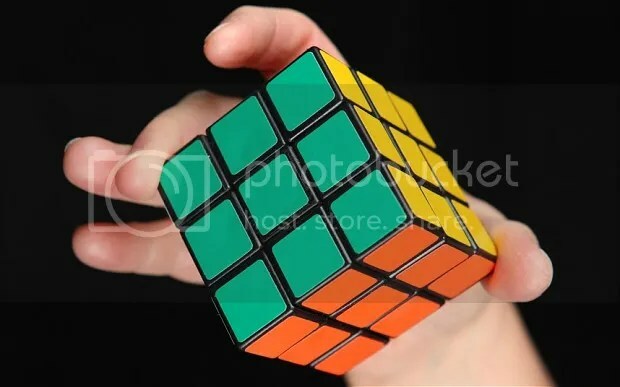 “Solve a Rubik’s Cube” is actually on my bucket list. If I ever manage it, you’ll be the first to know, fellow solvers. This entry was posted in Games, PuzzleNation, Puzzles and tagged Erno Rubik, games, Geeking Out, Pop culture, PuzzleNation, Puzzlin' fool, quintillion, rubik's cube, speed cubing by gmdirect. Bookmark the permalink.